Move-in day at the new Trevor Colbourn Hall brought new possibilities and lifted spirits. Choosing to become a professor or teacher of any kind may very well be about something as simple as your reaction to fall. If you were a kid who loved to return to school after the boredom of summer, even if you couldn’t wait for it to arrive each May, maybe that feeling drove you to seek a life in school. Of course, your attitude toward September might have actually been a complicated thing colored by how nice your previous year’s teacher was or whether you could afford the “right” clothes or whether your best friend had moved away over the summer. Still, most of us who teach have that sense of rising excitement at the end of each summer. If you are a parent sending your child off to school, you feel it, too. One of the privileges of school for both teachers and students is that we get to start over every year or every semester. This clean slate leads us to believe that things can really change, that new things can happen—a helpful attitude in school and, really, throughout life. It’s productive and exciting to have a palpable sense of possibility. When I first came to UCF in 2003, I had a bit of difficulty with this because the weather didn’t seem right. In the other places where I had lived—mild Tennessee, harsh Minnesota, and in-between Pennsylvania—there had been those cool evenings to signal that fall was coming. In Florida, my circadian rhythms didn’t line up, and I found it challenging to believe that fall term was about to begin. Instead, the scalding days of August seemed to stretch interminably into September and even October. I struggled to find the lift in energy levels that had always come with cooler weather and fall term for me. Eventually, of course, I adjusted. I began to see the subtle changes in climate as Florida would move into fall. The difference between 90 degrees and 80 degrees is significant, after all. Because of a visit to Corkscrew Swamp Sanctuary near Naples, where I saw an array of exotic (to me) birds, including painted buntings and wood storks (the sublime to the homely), I became aware soon after coming to Florida of the stunning bird life. I also began to watch for the birds that fly back and forth over Florida, stopping along the way, in massive seasonal migrations. A variety of hawks, falcons, herons, warblers, and thrushes, as well as waterfowl, flow through the state every fall. Soon, I also began to appreciate the startling colors of fall flowering plants, even if we don’t have the bold leaf-changes of more northern climes. All you have to do is come upon a massive spread of blooming blue clock vine or wildly orange Florida flame vine or the vibrant purple of beautyberries, and you come to understand that fall here has profuse colors of its own. This fall, however, some of us at UCF have a more blatant sign of possibility and change: the new Trevor Colbourn Hall, which some of us have already nicknamed “Trevor.” Over the summer, we cleaned out the old Colbourn Hall—named after UCF’s second president—and the first week of August we moved into the new, shiny one. As with any change, there are some things we’re not crazy about and some things that will take a while to work out. 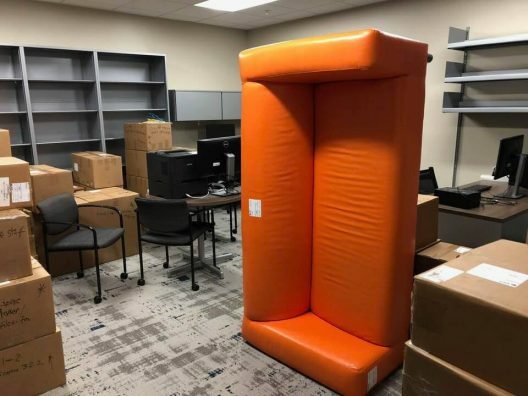 But there’s also a little lift in most everyone’s spirits—exploring the building to find out where various offices and people ended up, helping each other with boxes and locks, chattering in the hallways like I haven’t heard in years. Moving was a daunting task—we had 174 boxes for The Florida Review, and I brought home about 10 boxes of my own books because my new office is smaller than before. I ran into a senior colleague, drenched with the sweat of moving in August in Florida, when she was moving her personal items. “A lot,” she said. “I’ve been here a long time.” But even though she looked exhausted, her eyes gleamed with excitement. Probably none of our eyes will gleam with tears when the old Colbourn comes down. It is slated for destruction within a few weeks. I’m sure there was the same kind of excitement when it was new that we feel now, but it’s a building that has lived past its time. The university decided not even to try to rehab it, but just to tear it to the ground. Some of us contemplated having a take-down party to watch the wrecking balls do their work. But we decided we didn’t really want to breathe that dust. I’ve thought much in these days about an Idler essay written by Samuel Johnson in 1760, “Honour of the last.” He notes that “it is only by finding life changeable that we are reminded of its shortness.” A friend of mine in graduate school gave me a copy of this essay when she was moving from one phase of life to another, and I always have loved it for how it encourages us to face mortality in our daily lives, what now we might call practicing mindfulness. No doubt, we will pause and perhaps share a moment of nostalgia for a place so many of us spent so much time learning, teaching, meeting, debating, making friends, making enemies, writing, advising students, filling out paperwork, snatching a bit of lunch at our desks, and many other tasks that make up a faculty, staff, or student life. I have one particularly fond memory of how, in my first year, my then-husband-to-be had an office on the fourth floor and would come by to see me on the third. I remember him peeking around the door frame to see if I was busy or could take a minute to chat. There are memories in the old building, and, just as we start each school year with some regret that summer is gone, we will have to say goodbye to the old Colbourn. I hope we’ll all pause and reflect before we move on to the thrill of the new and fill our lives back up with possibility. Awareness of death and awareness of life are, after all, inextricably entwined. The turning of the seasons always provides this reminder—if we notice. Lisa Roney is an associate professor of English in UCF’s Department of English. She can be reached at Lisa.Roney@ucf.edu.